A nice selection of Thanksgiving food suggestions! - Our Sunday Cafe, the Retirement Edition! A nice selection of Thanksgiving food suggestions! We are just now getting over the community virus that has plagued us for more than six weeks, it seemed to have cycles of getting better and then rebounding. This has been rather bothersome, to be honest, and to say we are delighted that it appears we are healed is an understatement! Our Thanksgiving dinner has been planned, all we have left is some shopping and then, of course, a bit of travel to go and be among family and friends. My offering to the combined buffet we shall set out for our group to enjoy is a Roast Turkey with Cornbread Stuffing and Rich Pan Gravy. If all I ever got to eat on this day is cornbread stuffing and gravy, I would be happy! 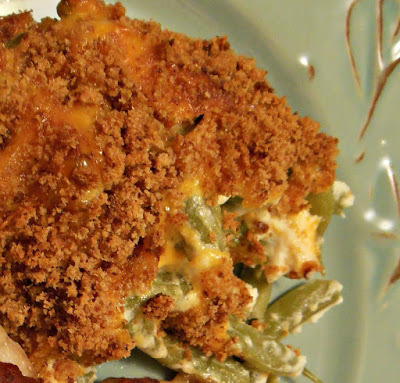 Green bean casseroles are a must for so many families. This one is not like the mushroom soup variety (no disrespect intended, we still use a can of this from time to time), this one is even called Green Bean Cobbler, AKA The other green bean casserole. Delightful with sour cream, cheddar cheese, and a crunchy buttered crumb topping. So are dinner rolls. These Cottage Cheese Dinner Buns are very festive and so easy! Stir them up, let them sit a bit to proof then ready the dough for baking. They bake up quickly fresh and hot while you are making gravy. Don't forget to pass the butter! You may prefer this Cheese Garlic Dinner Buns or even these Whole Grain Dinner Buns. This is a well-loved recipe! Pumpkin Pie Ice Cream. Pumpkin pie is traditional, but this cream and rich tasting non-dairy ice cream would be perfect to share as well. Especially for those with food restrictions. It is not only delicious but offers that same great taste we all have come to enjoy and look forward to at Thanksgiving time. Pineapple Raisin Sauce, my mom's recipe! If you also serve a Ham for your celebration, this Pineapple Raisin Sauce is a must. And because you can never put too many vegetables on the table these Braised Green Beans with Tomato Garlic and Thyme. May your table be filled with food upon it, family around it and love in abundance! Everything looks delicious! I can't wait. What time is dinner? Thanks! We are 3 hours from this planned dinner, I think more for you! But one day it would be grand to share a meal my friend.